Small Computer for small price. (photo credit jwrodgers). This monitor picks up on the quietest of murmors. That wouldn’t be so bad, except that it makes the walkie talkie ending sound. You know the one where it goes “CHH”. I’m just waiting on the microphone, but I’ve already set up a system where I can see the cot from my Android or iPhone. Keep reading if you are interested in the technical details. If you are the kind of person that would find writing the code for a web page fun, you might like to try it yourself. in my browser (on android or iPhone), will show the latest photo. 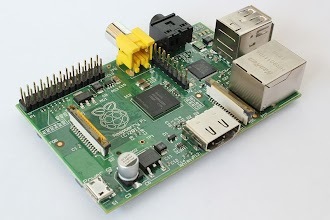 If transferring a new operating system to an SD Card makes you feel a bit squeamish, buy an SD Card that is pre-loaded with Raspbian, the official Raspberry Pi operating system. I had trouble with my power supply, the Pi didn’t ever connect to the network. Switching to the official power supply fixed the problem, I think the one I was using didn’t make a good connection, or supply enough power. I don’t have a HDMI monitor cable that would connect to Raspberry Pi, so I logged in via SSH. Plug a network cable in, power the Raspberry Pi on and wait for the solid green LINK led to show. There is a PDF on that page and you can follow the instructions to take your first photo. I’ll post some photos of the set up, and perhaps some code in my next update if anyone is interested.